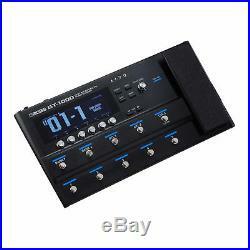 Boss GT1000 Guitar Effects Processor. Delivering unmatched sound quality and musical expression, the GT-1000 ushers in a new era of performance in amp/effects processors. This premium tone machine debuts the groundbreaking new AIRD (Augmented Impulse Response Dynamics) technology, realized with decades of advanced BOSS research and supported by an ultra-fast DSP engine, 32-bit AD/DA, 32-bit floating-point processing, and 96 kHz sampling rate throughout. Based on BOSS's acclaimed Tube Logic approach, the comprehensive AIRD system in the GT-1000 brings unparalleled musical response and flexibility to a digital guitar processor. AIRD amplifiers live and breathe like real tube amps, providing inspiring feel and authentic tonal dynamics that were previously unattainable. And with sophisticated AIRD Output Select functionality, you're able to consistently achieve this amazing sound with any setup, from standard guitar amps to direct recording and full-range stage monitoring applications. The GT-1000 also features a huge range of cutting-edge BOSS effects to enhance your tones, with numerous routing options and extensive real-time control at your command. And with the convenience of built-in Bluetooth®, you can adjust sounds, configure control assignments, and organize patches wirelessly from your mobile device using the BOSS Tone Studio app. Packing immense creative power in a streamlined pro design, the GT-1000 is a game changer that brings new levels of musical expression to guitarists everywhere. Flagship guitar amp/effects processor with uncompromising sound quality and unmatched expressiveness. Industry-leading 32-bit AD/DA, 32-bit floating-point processing, and 96 kHz sampling rate throughout. Next-generation BOSS DSP engine, custom designed specifically for music applications. AIRD (Augmented Impulse Response Dynamics) technology realizes BOSS's acclaimed Tube Logic concept in a digital guitar processor, delivering natural feel and optimized integration with all types of external devices. Highly expressive amplifiers, meticulously crafted with AIRD. Massive selection of onboard effects, including BOSS MDP effects and algorithms directly ported from the DD-500, MD-500, and RV-500 pedals. Amps and effects can be routed in numerous series and parallel combinations. Ultra-fast patch switching and delay/reverb carryover. Innovative Stompbox feature greatly simplifies using common effects settings in many different patches. Easy operation with large display and six user-assignable switching knobs. Ten footswitches and integrated expression pedal with user-configurable assignments and LED colors. High-resolution tuner with two display modes and mono or polyphonic operation. ¼-inch main outputs and XLR sub outputs with independent AIRD Output Select settings; loop for external stereo or mono effects. Support for external control via footswitches, expression pedals, MIDI, and USB. Built-in Bluetooth for wireless editing from iOS and Android mobile devices. USB audio/MIDI interface for computer-based recording and editing. Designed for Unparalleled Sound Quality. The GT-1000 is BOSS's most advanced amp/effects processor to date, built for no-compromise audio performance. To start, it's the first-ever guitar multi-effects unit with 32-bit AD/DA, 32-bit floating-point processing, and 96 kHz sampling rate throughout. There's an all-new DSP engine as well, specially designed for music applications and featuring over three times the power of previous generations. This immense processing muscle unlocks far greater sonic detail than ever before possible, making it quick and easy to get the sounds you're after without endless parameter tweaks and microscopic EQ adjustments. If you've shied away from other amp/effects processors because they're hard to dial in and missing that "real deal" vibe, the GT-1000 is sure to change your mind. AIRD: A Revolution in Digital Amp Processing. At its core, the GT-1000 harnesses BOSS's breakthrough AIRD technology for previously unattained musical power. Based on the comprehensive Tube Logic concept behind the renowned Katana, Waza, and Blues Cube amplifiers, AIRD takes the amp processor to a new level of performance, flexibility, and practical usability. The tube amplifiers that guitarists love are interactive, highly expressive musical instruments that are far more the sum of their individual components. The Tube Logic design philosophy fully realizes this interactive experience, and it's been hugely successful in the self-contained guitar amps where it's been employed. However, bringing this approach to a guitar processor like the GT-1000 introduces many challenges, because players will use it with a variety of external amplification systems that add their own characteristics to the sound. BOSS developed AIRD to address these challenges, employing sophisticated techniques to ensure that the GT-1000's groundbreaking musical response can be consistently experienced in any application where the processor is used. Highly Musical Guitar Amplifiers, Crafted with AIRD. The GT-1000 is loaded with immensely expressive guitar amplifiers, all meticulously crafted with AIRD. In contrast to traditional modeling methods, AIRD reproduces the complex internal component interactions of tube amps in every way, from guitar input to speaker output and everything in-between. The result is a complete interactive system that's a living, breathing instrument, just like your favorite high-end tube amp. A key focus of AIRD is the reactive amp/speaker relationship, which is essential to the dynamic feel and musical responsiveness of tube amplifiers. This vital relationship is fully brought to life with the GT-1000's amps, producing guitar tones that are alive with punch, presence, and depth. Thanks to AIRD, your sound always feels great under your fingers and "sits in the mix" properly, delivering a truly organic musical experience that's never been available from a digital guitar processor until now. The GT-1000 features a wide range of BOSS original amplifiers suitable for all guitar styles, from super-clean to ultra-heavy. A number of amp types employ Multi-Dimensional Processing (MDP) technology for dynamic, nuanced tone that reaches beyond the capabilities of analog designs. Classic tube amps throughout history are included as well, from coveted vintage combos to modern high-gain heads. Two amps can be used at once in a single patch, so you're able to switch between two sounds, blend amps for complex tones, or achieve big, expansive sound in stereo setups. Optimized Performance for Every Playing Application. AIRD enables the GT-1000 to smoothly flow into any creative setup, allowing you to enjoy great tone and response with minimal adjustments. By choosing from a large selection of AIRD Output Select types, you can perfectly tailor the GT-1000 for any destination, whether it's a guitar amp input, an amp effects return, a power amp driving guitar speakers, a computer DAW, or a full-range monitoring system. AIRD is fully integrated into the GT-1000's amplifiers at every level, so you'll always experience their authentic sound and interactive response no matter what you're connected to. And with the ability to apply different AIRD Output Select settings to the main and sub outputs, you can optimize the sound for two destinations at once, such as a guitar amp input and a direct feed to a house PA. The GT-1000's outputs also include independent ground lift functions, making it easy to tackle any hum issues that might be introduced with external devices. 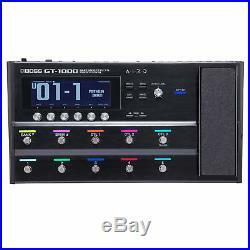 As you'd expect from a flagship BOSS processor, the GT-1000 is loaded with all types of outstanding effects, from overdrives and distortions to specialty effects like Slicer, Slow Gear, and a host of others. Many selections harness BOSS's MDP tech, which intelligently adapts to your dynamics and playing register to achieve the perfect sound. Advanced algorithms from the renowned DD-500 Digital Delay, MD-500 Modulation, and RV-500 Reverb pedals are included too, along with sophisticated Acoustic Resonance processing inherited from the AD-10 pedal for acoustic/electric guitar. Amps and effects can be configured with various series and parallel routing options, and signal paths can be divided and mixed at multiple points. Patch switching is ultra-fast thanks to the GT-1000's speedy DSP, and delay/reverb carryover is also possible. There are two effects loops as well, allowing you to connect your favorite external effects and preamps. Streamlined Design, Ready to Travel. In today's music world, players need to travel as light as possible, and BOSS designed the GT-1000 for maximum control in a minimum amount of space. In comparison to other processors in its class, it offers a compact, streamlined design that's easy to carry and set up. The metal chassis is both strong and light, and features an array of freely assignable footswitches and an integrated expression pedal. Newly developed specifically for the GT-1000, the low-profile footswitches reduce size and weight while maintaining the rugged durability that all BOSS gear is famous for. With the GT-1000's large display and six switching knobs, the process of creating and adjusting sounds is smooth and efficient. Four different Play screen layouts provide alternate viewing options for various patch functions, and you can customize the knobs for quick access to specific parameters. While editing, the signal chain is clearly displayed, and it's simple to select effects blocks, adjust parameters, and change the order. The available parameters for selected effects can be displayed in layers, letting you see everything at once on screen. An innovative new workflow feature in the GT-1000 is the ability to save any effect as a Stompbox. Parameter adjustments to a Stompbox are reflected in all patches where it's used, basically mimicking the way you'd use physical pedals. This is ideal for effects where you use the same settings most of the time, but just need to make small adjustments occasionally. Now, you can make those changes quickly across multiple patches, eliminating the hassle of tweaking and saving each patch separately. With its ten footswitches and expression pedal with toe switch, the GT-1000 gives you comprehensive creative control on stage and in the studio. And if you're a power user, there's support for additional control via external switches, pedals, MIDI, and USB. By default, the main footswitches are assigned to select patches, patch banks, and three control assignments. If you like, you can reassign the switches to control nearly any function, including effects on/off, tap tempo, parameter adjustment, system settings, and more. Using the GT-1000's switching knobs and powerful Assign Matrix, control assignments are quick and intuitive. It's also possible to assign different colors to the status LEDs above the switches, and easily view the current switch assignments with a Play screen option. USB Audio/MIDI and Wireless Editing via Bluetooth. The GT-1000's well-organized panel interface is a breeze to navigate, but things get even easier with your smartphone or tablet. The GT-1000 is equipped with onboard Bluetooth-a first for a pro-level amp/effects processor-allowing you to wirelessly manage sounds from the dedicated BOSS Tone Studio app for iOS and Android. Whether at home, in rehearsal, or on stage, you can comfortably tweak the GT-1000 from your device without having to bend over and edit via the hardware. It's even possible to record a riff with the GT-1000's built-in looper, and then roam the venue and adjust tones from the audience position! The GT-1000 includes a USB audio/MIDI interface as well, with multi-channel audio operation for flexible computer recording and efficient re-amping. USB can also be used to edit and organize sounds with the desktop version of the BOSS Tone Studio editor for Mac and Windows. Merchandise and packaging MUST be in the same condition as when received. Alto Music reserves the right to refuse any return if it appears the item has been used. Software (if unsealed or registered). Harmonicas, Mouthpieces, Earbuds/Earphones/Headphones(if unsealed), or any item that may come in contact with the mouth, ears or nose. There are no warranties for the following items. 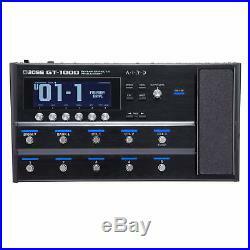 The item "Boss GT1000 Guitar Effects Processor" is in sale since Wednesday, May 2, 2018. 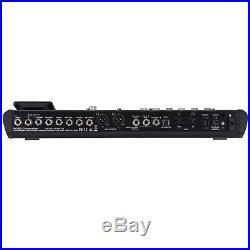 This item is in the category "Musical Instruments & Gear\Guitars & Basses\Parts & Accessories\Effects Pedals\Multi-Effects". The seller is "altomusic" and is located in Middletown, New York. This item can be shipped to United States, Canada, United Kingdom, Denmark, Romania, Slovakia, Bulgaria, Czech republic, Finland, Hungary, Latvia, Lithuania, Malta, Estonia, Australia, Greece, Portugal, Cyprus, Slovenia, Japan, China, Sweden, South Korea, Indonesia, Taiwan, South africa, Thailand, Belgium, France, Hong Kong, Ireland, Netherlands, Poland, Spain, Italy, Germany, Austria, Bahamas, Mexico, New Zealand, Singapore, Switzerland, Norway, Ukraine, Croatia, Malaysia, Brazil, Colombia, Panama, Barbados, Bangladesh, Brunei darussalam, Bolivia, Ecuador, Egypt, Iceland, Cambodia, Sri lanka, Luxembourg, Macao, Maldives, Nicaragua, Peru, Pakistan, Paraguay, Viet nam, Uruguay.